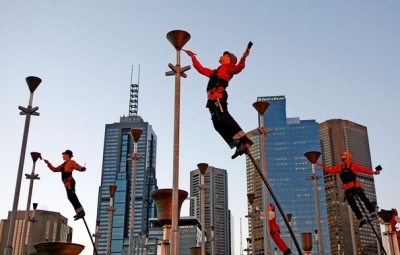 The Melbourne International Arts Festival (MIAF) is a celebration of dance, theatre, music, visual arts and multimedia consisting of outdoor and free events held during the month of October in a number of venues across Melbourne. The city of Melbourne is well regarded as the cultural capital of Australia with a welcoming and friendly hub of activity, which is a reflection of the culturally diverse residents from over 140 nations that harmoniously live here. It provides the ulitmate setting for MIAF, Australia's premier arts and culture event. Each year the festival brings a range of dance, theatre, music, visual arts, multimedia and outdoor events from renowned and upcoming Australian and International artists to Melbourne and its surrounds. It also offers a wide variety of free family-friendly events for the public to enjoy. What better reason to visit fantastic Melbourne and take in the sights and sounds of a vibrant city in action. BookToday has a wide selection of accommodation close to the Melbourne International Arts Festival. Stay close to the action and be a part of this unique artistic event in Melbourne. If you require further assistance with your accommodation selection, feel free to call 1300 733 274 and talk to one of our friendly customer service assistants.